Another Penniman Records must have, an instant classic early soul two sider. 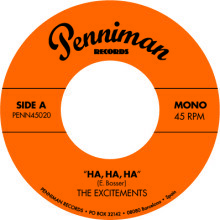 "Ha, Ha, Ha" is without a doubt the band's heaviest original hit until it's release date. With it's stinging intro by Koko, this "catchy ode to lazy husbands" rolls into a stomping groove with New Orleans flavour that sticks to your mind for weeks. A concert staple since the first day it was played live, it was a must to release it on a 45 for dj's to spin endlessly party after party. The usual B-side slow number is completely ignored here, since "I need you baby" shoots the frenzy dancing even higher. The early sixties Phil Flowers number is further proof of how this guys can turn any venue upside down, and you can play it again and again at home too!